Have you heard that clanking sound of irons when you lift your golf cart bag? Did you know that your iron clubs often end up banging each other when left in a golf cart bag. Most golfers don’t even end up thinking about it, you must realize that these are metal tools of the game – your most important weapon! Most of us are passionate about our iron clubs and like to keep it looking brand new. So we opt for iron covers, which is not really acceptable in the golfing world – you gotta agree on that one! Well, Ogio just went and sorted all these issues with their Chamber cart bag. The Ogio chamber cart bag comes with a 14 way diamond top with advanced silencer club protection membrane. One of the key features of this bag is its superior club protection membrane system. The 14-way top has slotted soft rubber membranes which keep clubs protected from swaying and clanking into each other. Then there’s the heart of the operation…the Silencer Base, which utilizes a compression-fit mechanism at the very bottom of the bag to secure the grip of each individual club and lock it into place. You will actually feel the club lock down when you secure it into the system. And with every club locked into the silencer system you can actually take the bag and flip it upside down without a single club falling out. Isn’t that uber cool! Storage is not really an issue here. And honestly I’m impressed at the details that they’ve looked at while designing this bag. They’ve looked at every minute detail to make it fully functional and convenient! 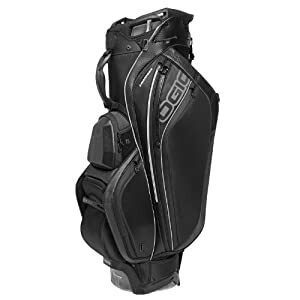 Golfers looking to protect their iron clubs from regular wear and tear in the bag and those who carry a lot of accessories during the game should opt for this bag. This bag is so durable that it may be the last bag that you may buy!